My husband always makes fun of the fact that I don’t know how to cook for 2 people. The way I see it, cooking too much food just means you get to be creative with leftovers the next night. 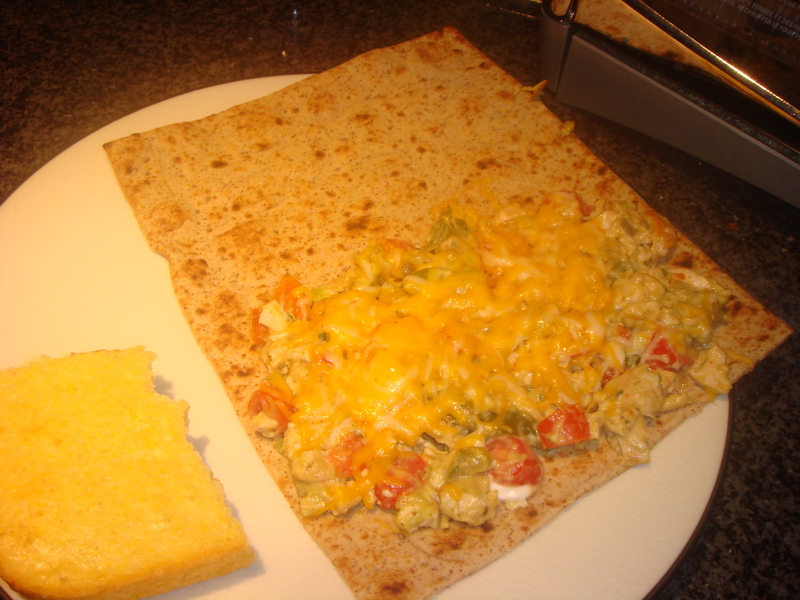 I’m very much a fan of variety so one of my favorite challenges is to turn leftovers into a completely different dish. Tonight’s challenge: fajitas! Chicken salad is one of my favorite deli staples, but it’s one of those foods that I don’t usually indulge in unless I make it at home because the difference in calories is just ridiculous. So tonight on the ride home I was inspired to use the leftover chicken to create a “fajita chicken salad”– basically a chicken salad with the fajita veggies instead of your average celery (or apples, which is what I usually put in mine). Now, I didn’t post about the fajitas last night because they were super simple. I actually used Trader Joe’s taco seasoning mix to cook both the chicken and the fajita veggies. The guacamole also was very straightforward… not one of my more creative versions. So here’s what I did. First, you want to dice the chicken into bite size cubes (I say the smaller the better). 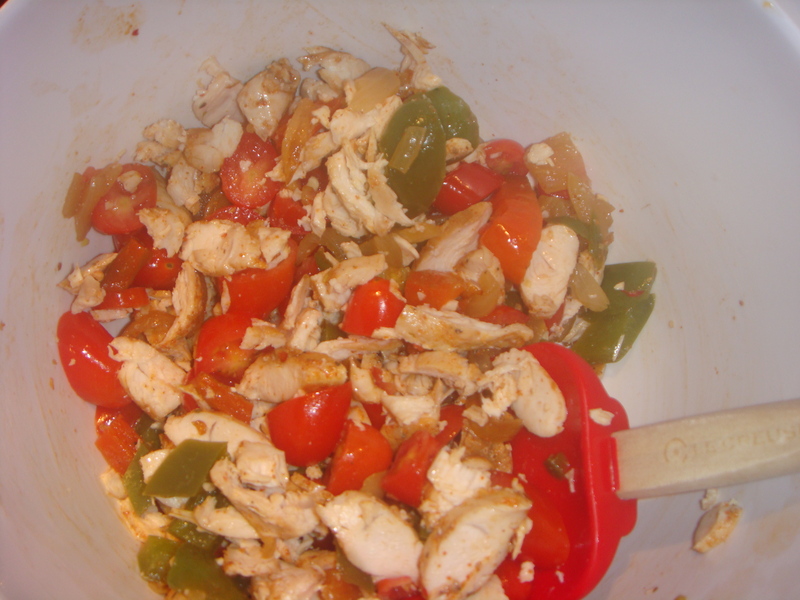 Chop up the peppers and onions so they’re the same size as the chicken and add to bowl. Rough chop some cherry tomatoes and add to the bowl as well. Mix so you can see the ratio of veggies to chicken and add more veggies as needed to get the balance you prefer. (Veggies are a great way to bulk up anything so when in doubt, add more veggies! You’ll still get the chicken salad essence even with only a little chicken in the actual dish.) Add 2 T light mayo to the bowl. There’s really no exact science for the amount of mayo you use, but it’s always better to start with a little and mix so you don’t end up with way too much. In order to add more creaminess and because guacamole doesn’t last too long in the fridge, I added the rest of the guacamole to the bowl as well. This is the point where you’ll want to taste for seasoning. 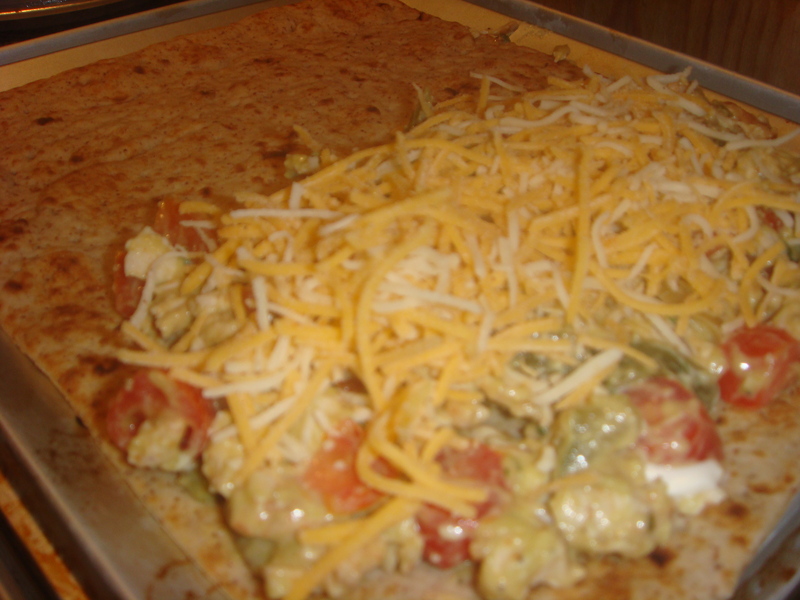 I had some extra taco seasoning on hand but it didn’t need anything more than what was on the chicken and veggies. Now this would be delicious on a cold sandwich, over a salad, or just out of the bowl, but my husband loves anything that is warm and melty so spread half the chicken salad onto a wrap and sprinkle the top with shredded Mexican cheese. Put the wrap onto a toaster oven tray and toast until the cheese has melted (the toaster tray will keep the wrap from getting crispy). This dish took a total of 4 minutes plus toasting time so it’s a great leftover/makeover. 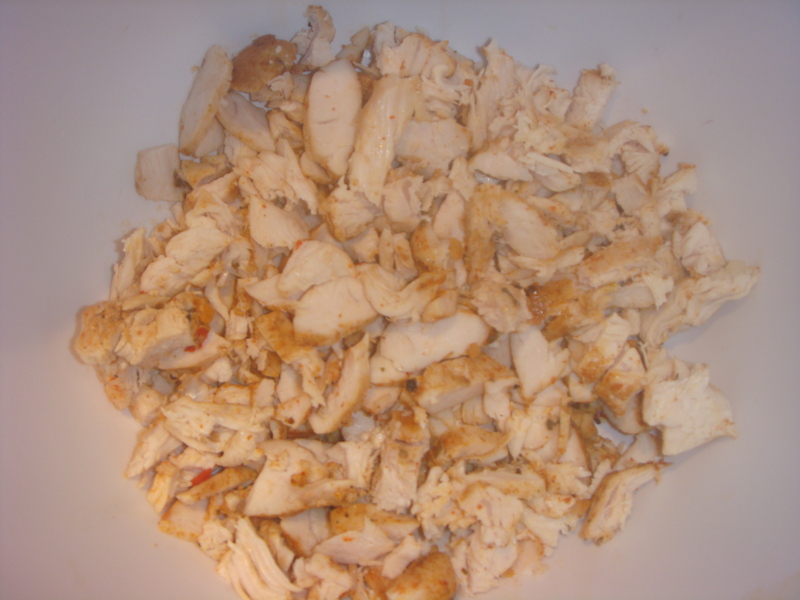 If you don’t happen to have leftover fajita makings in the fridge, you can just add all the same ingredients in their basic forms (grilled chicken, bell peppers, tomatoes, avocado– I’d skip the raw onion) and add the taco seasoning (or a blend of cayenne pepper, garlic salt, paprika, chili powder). It will still be a delicious and different twist on the classic chicken salad.